In the many Star Trek franchises, the Prime Directive is the guiding principle of the United Federation of Planets. In essence it states that there can be no interference in the internal affairs of other civilisations; that the development of a culture should be permitted to proceed at its own pace, unguided by external intervention. The term was introduced in the original 1960's series, but much of the refinement of the concept took place in the later Star Trek: The Next Generation franchise. Just as the United Federation of Planets is a thinly veiled analogue of the United Nations, so the Prime Directive corresponds to a concept in political philosophy known as Westphalian sovereignty. The term originates from the 1648 Peace of Westphalia, which many academics assert was the beginning of the modern concept of nation-states. There is much debate among political theorists and historians as to the validity of this claim, but this sideline is unnecessary for discussion of the concept. There are three elements commonly ascribed to Westphalian sovereignty. Firstly, the principle of the sovereignty of states – that is, the right of political self determination. This establishes the concept of a sovereign state. Secondly, the principle of legal equality between states, which determines that no sovereign state possesses legal ‘high ground’ with respect to another. Finally, the principle of non-intervention of one state in the internal affairs of another. The parallels with the Star Trek Prime Directive are apparent, with civilisations (principally portrayed as other planets) taking the role of the sovereign state, such that we might consider Westphalian sovereignty as “the real world Prime Directive”. Naturally, people are divided as to the wisdom of maintaining such a principle. Much criticism has been given in recent years to models of international relations which take the Westphalian notion of the nation-state as a unitary actor as an axiomatic principle. Arguments against this view note that treating all nations as separate entities overlooks the cultural enmeshment of the modern age, as well as other vital points of interconnection, such as the fact we all make use of the same environmental system as our “global life support”. Since the 1990s, the issue of Westphalian sovereignty has come under particular scrutiny in connection with military interventions (both proposed and actual) in Yugoslavia, Afghanistan, Iraq, Sudan and elsewhere. One proposed justification for violating the non-fictional Prime Directive is humanitarian grounds: that the prevention of imminent genocide (for instance) provides a just basis for overriding the principle. One dangerous consequence of this thinking occurs when people reason that the absence of democracy foreshadows future humanitarian crises, and thus claim that the absence of democracy creates a humanitarian justification for intervention. The fallacy of this reasoning can be found in the continued occurrence of humanitarian crises in democratic nations. For example, what was the aftermath of hurricane Katrina in New Orleans but a humanitarian crisis within a democratic state? Another such criticism relates to the idea of a failed state, a claim usually levied against Afghanistan prior to the NATO invasion of 2001. In such cases, it is often argued that there is no coherent sovereign state and thus intervention is justified both on humanitarian grounds, and on the basis that such failed states represent a threat to both neighbouring countries in particular, and the entire world in general. This represents a slightly less contentious situation: since the first element of the Westphalian concept is political self determination, any situation where this is absent may be a viable cause of action. How the absence of this state of affairs should be determined by people external to the region in question remains a matter of debate. Even within the context of Star Trek: The Next Generation, the idea that one should not intervene on humanitarian grounds proves difficult to uphold, and many Star Trek fans find the application of the Prime Directive in its more extreme cases to be quite absurd. For instance, in the episode “Homeward” the crew of the Enterprise is expected to stand idly by as a primitive civilisation becomes extinct as a result of an atmospheric disaster – in this situation in particular, fans were vocal in declaring the Prime Directive immoral in its application. The desire to bypass Westphalian sovereignty and allow for humanitarian intervention has lead to the development of new political philosophy concepts that would be open to such actions, in particular a newly evolving concept of contingent sovereignty. In this model, nation-states are assumed to have certain obligations, including the protection of its citizens, thus when a government makes war on its own people or conducts genocide it forfeits its claim to non-intervention. The appeal of such a variation – a Subprime Directive, if you will – is apparent. Kofi Anan, speaking in 1999 in the position he then held as UN Secretary General, advanced a view that there was a developing international norm that “massive and systematic violations of human rights wherever they may take place… should not be allowed to stand”, and furthermore that frontiers should not be considered an absolute defence behind which nation-states could commit crimes against humanity with impunity. In many respects, such a view can be seen as an evolving response to the atrocities of the Holocaust in Nazi Germany, and the commitment the world made at that historic juncture, but has thus far failed to live up to: Never again. The problem with this emerging concept of contingent sovereignty is in its application, and critics have been quick to point out the degree to which it affords powerful countries, such as the United States and China, too much leeway to invade sovereign states on the basis of their own private judgements of the moral standing of the country in question. It naturally follows that if contingent sovereignty is to be validly developed, it must be applied within the context of a transnational organisation such as the United Nations: no single country can be allowed to make the judgement call that results in the denial of sovereignty to another. Whether one supports or opposes the idea of the Prime Directive (both in a fictional and a non-fictional context), now is the ideal time for discussion of the application of Westphalian sovereignty or any principle that might replace it, such as contingent sovereignty. Since the latter depends upon violation of human rights as its yardstick, it inescapably follows that renewed discussion of human rights on the global stage is a necessity before attempting to codify new principles of sovereignty in international law. Certainly, we must not accept a hypocritical situation in which one nation-state violates the sovereignty of another while simultaneously committing gross violations of human rights statutes it has publicly ratified. We should take any and all necessary steps to ensure that such gross abuses will not be tolerated. 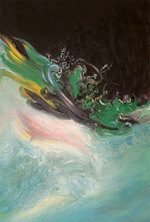 The opening image is an oil painting by Iranian artist Farnaz Tahbaz, which I found here. As ever, no copyright infringement is intended, and I will take the image down if asked. But I agree that we need to stop thinking of our world in terms of our own little pieces, and it will be hard, but it needs to happen. I understand that the UN was set up in response to the failure of the League of Nations to prevent World War 2. Though there are problems in the voting system itself (inherent flaws in any voting system rather than any problems with the UN that I know of) I feel that - as you seem to suggest - the UN is probably the best judge of when the notion of Westphalian sovereignty should be broken. I feel the fact that its verdicts have not always been listened to recently is cause for worry, however. I'll also add that I personally feel that the UN could perhaps intervene more - to ensure preservation of natural resources, landscapes and such. What? How dare you! All right-thinking people* know that $country is the *only* place with the Right Moral Values, and all those $expletive $epithet $derogatory_term foreigners should damn well know it! We'll impose our systems on them by force if we have to - it's all the best for them in the long run! * Anyone who doesn't share these values is clearly not Right-Thinking**, so doesn't count. ** Should we rewrite "Highlander" as (moral) "Highgrounder"? Tag line: There can be only one. Bezman: the UN, or something like it, I suppose. I dislike the influence that certain specific nations have in the UN, but it is largely unavoidable and I don't see a new body being much different. The US, as the country with arguably the most influence in the UN, should certainly be able to get an agreement from the UN on any relevant actions - if it cannot, it's a sign that something is wrong. "The US, as the country with arguably the most influence in the UN, should certainly be able to get an agreement from the UN on any relevant actions - if it cannot, it's a sign that something is wrong." Really? So you are saying we should have an overriding council with the biggest nations afforded the biggest say in what happens to everyone else? "Really? So you are saying we should have an overriding council with the biggest nations afforded the biggest say in what happens to everyone else?" No, I'm saying that given that certain nations currently *do* have the biggest say, it speaks volumes when one of those big nations *can't* get an agreement. If you look at my previous comment I expressly say: "I dislike the influence that certain specific nations have in the UN, but it is largely unavoidable and I don't see a new body being much different." Like it or not, the big nations *do* have the most influence on the world stage, regardless of the situation in the UN itself. Nationhood is such a flawed concept, I become downcast at the very thought of engaging with its flaws. But it is what we have. In a real-politik sense, the best way out of undue influence from large nations is a more realistic accountancy method for the world economy, where we realise that natural resources are not free, and output of industrial processes must be ecologically offset or capped. This might create more balance, because power comes from monetary wealth, and this wealth seems to be associated with urbanisation. Making the world economy a self-regulating system must necessarily check growth in the developed world and shift power to the developing world, who own so much of the natural offset to industrialisation. Example - island nations are surrounded by massive quantities of carbon-processing micro-organisms. zenBen: I tend to agree with what you say here. I am heartened by the situation in Costa Rica where farmers who maintain forest land are paid for the ecological services the forests provide. More work in this area would be most welcome! "zenBen: I tend to agree with what you say here. I am heartened by the situation in Costa Rica where farmers who maintain forest land are paid for the ecological services the forests provide. More work in this area would be most welcome!" This is why I think that as you allude above, "the idea that the Kingdom of Togo should have the same influence as China is a bit absurd. :)" is *not* absurd. If we actually let the people who *haven't* got more "influence" - by which we mean power, which in this world is mainly industrialised nations - have an equal say, maybe we industrialised nations can start to learn what we need to do to get back in step with nature. We need to seriously take on board stuff that we have all but forgotten, and learn how to live on a planet of limited resources with an increasing demand for those resources. Was it Costa Rica, or maybe Bolivia, that recently offered to hand over its rainforest management to Britain in exchange for economic aid for sustainable development? A great opportunity, lets see if the Brits have the cojones to step up to the plate! On the flip side, I recently heard that the world bank owns deeds top much of the Amazon basin, obtained as collateral for a debt that Brasil couldn't pay. That could be apocryphal though. I wouldn't trust the UK with rainforest management. We have no forests left, let alone rainforests. You have to watch the latter the whole way through to get the context. Frankly, it's crazy stuff, and has no corroboration. But it could just be crazy enough to be true - in a twisted way, everything he's saying makes a kind of sense and sheds light on the madness of the last 8 years of Bush.